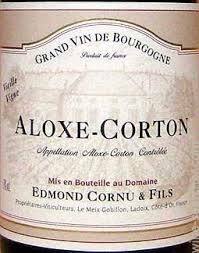 2015 Edmond Cornu Aloxe Corton 1er - $59.99: Vins Rare, The finest selection of rare wines. Burghound Rating: 90-93 Outstanding Top Value! A fresh, pure and layered nose consists of liqueur-like red berry fruit, plum, violet, earth and touches of game and forest floor. There is excellent richness to the robust and intensity medium weight plus flavors that coat the palate with dry extract where the supporting structure arrives all at once on the finish. This very fine effort is very Aloxe in basic character yet it is not really rustic or austere. As an aside I had to laugh when Cornu described this as a "rugby man wearing a tutu"! Burghound 90-93 Outstanding Top Value!